Archadeck Outdoor Living is pleased to introduce financing options from LightStream, a quick, hassle-free way to finance your outdoor project. Click the banner to apply today. 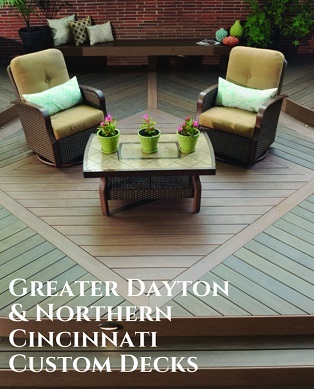 Archadeck of West Central and Southwest Ohio “America’s Deck and Porch Builder®” has been providing award winning outdoor living spaces to the Miami Valley since 1990. 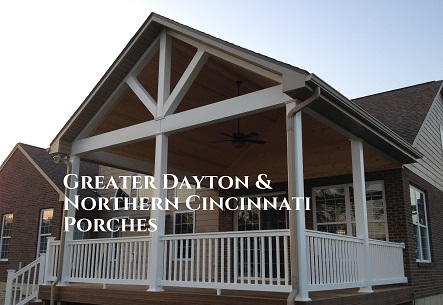 Specializing in custom designed decks, screenrooms, sunrooms, gazebos, pergolas, and Shadetree® Canopies. With a NARI Certified Remodeler, trained design consultants, and a professional staff we deliver the dazzling outdoor living experience that you will enjoy and your neighbors will envy. NARI Contractor of the Year Residential Exterior Specialty 2007, 2008, 2009, 2010, 2012, 2013 and 2015! We invite you to call for a free design consultation . At your consultation we’ll show you past projects, discuss your needs and tastes, explain your construction material options (including the new, low-maintenance wood alternatives), talk about costs, and measure and photograph your home/lot. It is always an honor to be asked to speak within a forum about the topics we love so much here at Archadeck of West Central & Southwest Ohio. 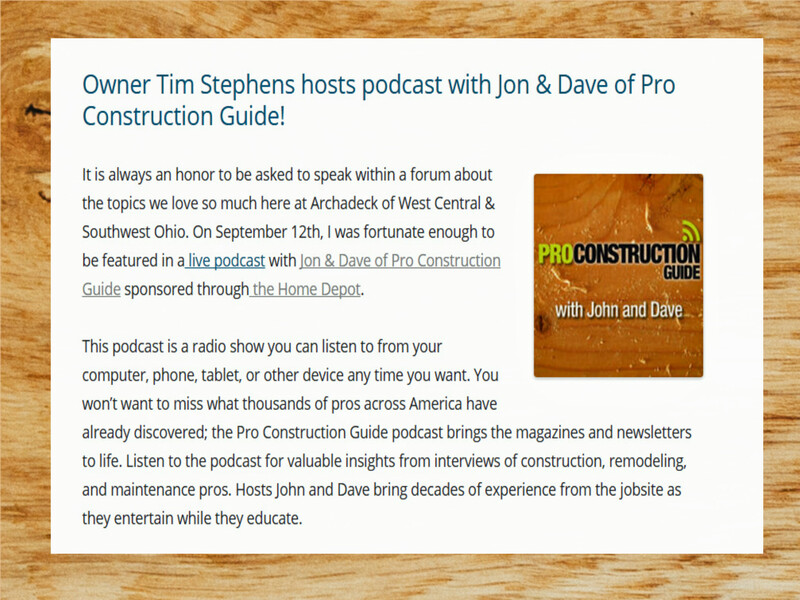 On September 12th, I was fortunate enough to be featured in a live podcast with Jon & Dave of Pro Construction Guide sponsored through the Home Depot. Please visit https://itunes.apple.com/us/podcast/pro-construction-guide-podcast/id1028908337?mt=2&ign-mpt=uo%3D4 to listen to the podcast in its entirety. Great Products and very nice people! I already referred one couple who have also built a deck with Archadeck. Quality work, and more importantly, great owner who is responsive to his customers before and after the sale. It’s obvious Tim cares about the work his company is doing. Excellent quality of design and work. Very attentive to details. Willing to work on small projects as well as larger ones. Open and honest about costs and time table. Response to issues that came up during construction. I liked the fellows who did our work and was impressed by their expertise and capability. Flexibility of design options and quality of workmanship. It is beautiful and well made. Everyone who sees it comments on how nice it is- only problem- now I can’t get people to leave! THE QUALITY OF THE MATERIAL AND WORKMANSHIP. ANY QUESTIONS WE HAD WERE SEEMINGLY ANSWERED IN OUR BEST INTEREST. THEY WANT YOU TO BE INVOLVED IN THE PLANNING, BUT ARE RIGHT THERE TO GUIDE YOU OR SUGGEST IDEAS FROM THEIR BUILDING EXPERIENCE. LOVED TALKING TO THE BUILDERS AS THEY WENT ALONG. WE’RE JUST WAITING FOR WARMER WEATHER AS OUR DECK WAS FINISHED IN NOV. The FINAL product shows the excellant workmanship and quality of materials used. All promises made were kept. The deck is absolutely beautiful and changes the look of the whole back yard, the color matches the trim on the house and the privacy fence. We have had so many compliments on the style and color from neighbors. It turned out beautiful. It really enables us to live outside more! Kayla did an outstanding job of staining our deck. She was very thorough. Deck looks new. 100% satisfied with the service provided. Very happy with the deck clean and seal and quick completion and follow up to any concerns we had. Great Job! Kayla did such a good and thorough job for us for all aspects of the job. Highly recommend. Thanks. Thank you!!!!!!!!! Wayne and crew were just here. Fixed it and inspected all other rails. Thank you so much for your care, concern and overall great, great service!!! I am so glad that I chose you for my new deck. The 2 best aspects of our project were its attractive design and its construction quality. We are ecstatic with our new deck. The attention to detail and the ‘extras’ that you did without charge to me is so much appreciated. If I can ever help you with another customer, send them to me. No one could be a better advocate for you than me! Bob came home this past week and was very excited about his new deck and ramp. It is going to make life so much easier for he and Ruth. Thank you again for helping us to this for them.